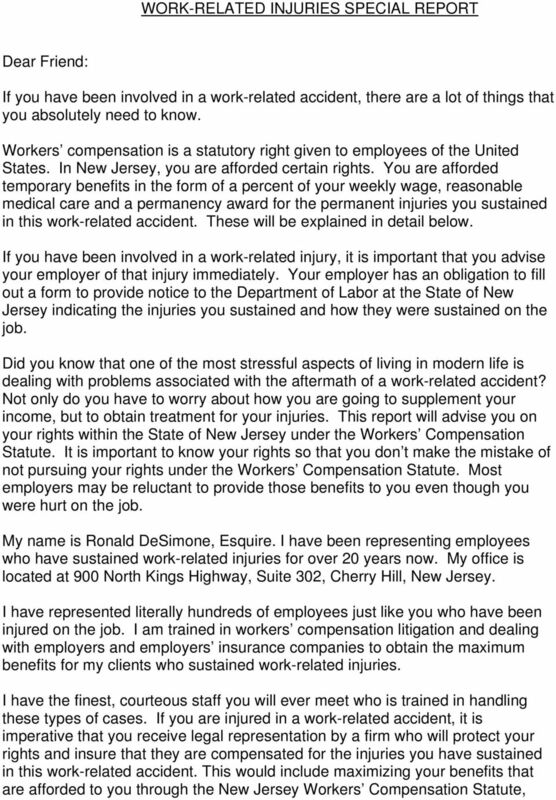 Download "If you have been involved in a work-related accident, there are a lot of things that you absolutely need to know." 5 sum settlement, then that settlement will be made with prejudice. 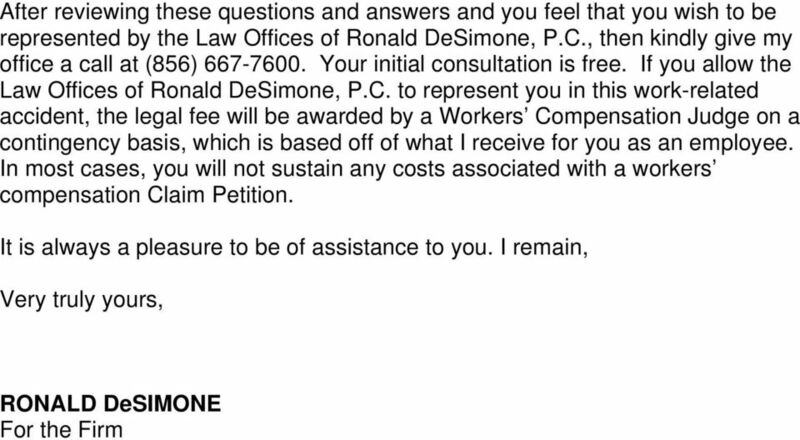 This means that the employee will never be able to reopen his workers compensation case again with reference to those injuries he sustained, which are the source of that lump sum award. If a case is resolved by a Judge, either through Order or by an Order Approving Settlement, then the employee will have the ability to reopen their case within two years from the last date of benefit. This will occur so long as that employee can prove that the injury that they sustained in reference to the work-related accident has gotten worse. If it has gotten worse, the employee could be entitled to additional temporary benefits, additional medical benefits and an additional permanency award. The permanency award would be granted at a higher rate less than what he has been paid for in the past. The employee s case can be reopened as many times as he can sustain his burdens as provided above so long as he files a reopening petition within that two-year period from the last date of benefit. 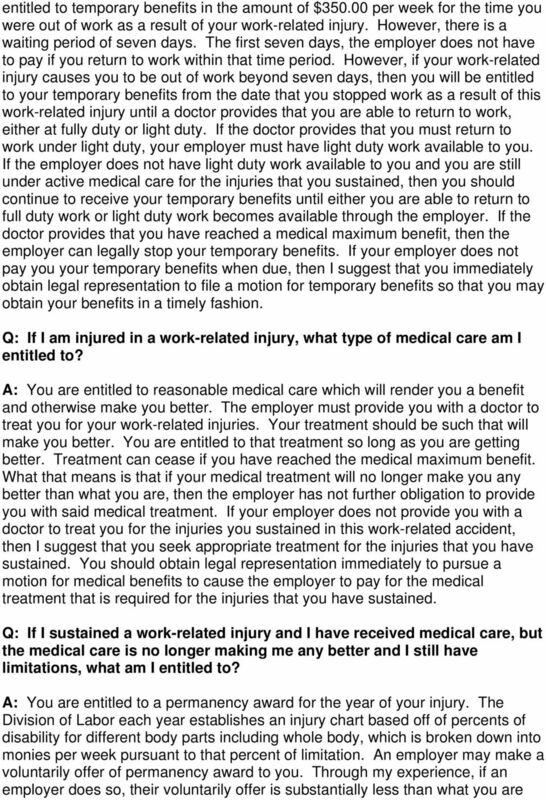 Q: If my injury causes me to be unable to ever return to work, what rights do I have? A: The employee may pursue a case against his employer and/or against the Second Injury Fund to allow him to receive benefits up until the date that the employee expires. However, a Second Injury Fund application must be filed with the Court in those situations through a New Jersey licensed attorney. 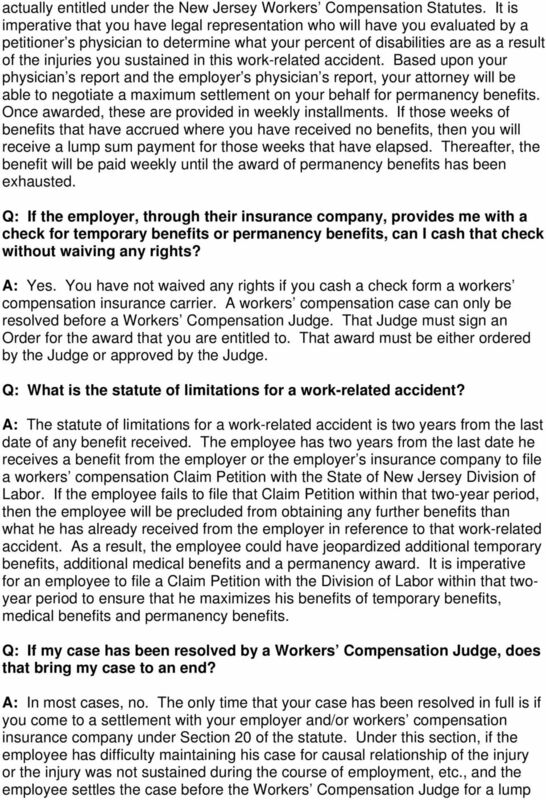 Q: If I am receiving social security disability, does this affect my workers compensation award? A: Yes. The employee may only receive 80% of his gross monthly salary from all benefits received. What this means is that you must calculate what you are receiving in workers compensation benefits and add to it your social security disability benefits. That total must be equal to or less than 80% of your gross average weekly wage just prior to injury. If it is greater, then social security shall seek a setoff reducing your social security benefits so that they will equal the 80% gross monthly wage. 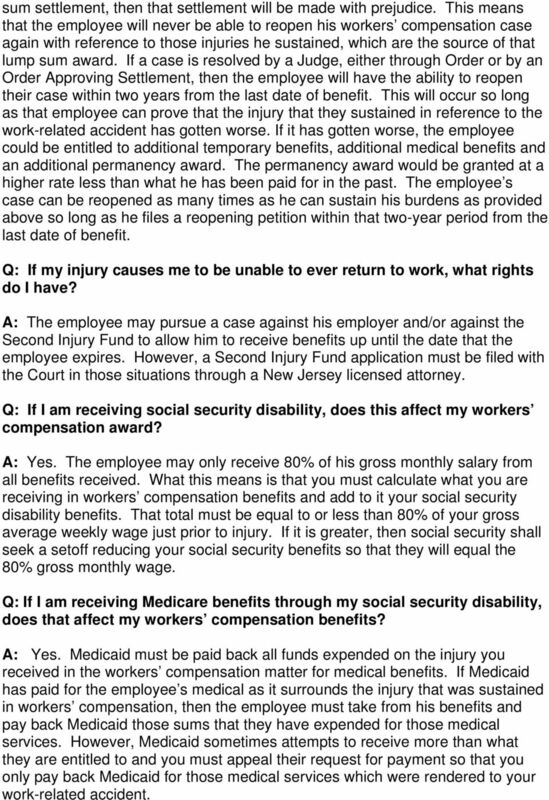 Q: If I am receiving Medicare benefits through my social security disability, does that affect my workers compensation benefits? A: Yes. Medicaid must be paid back all funds expended on the injury you received in the workers compensation matter for medical benefits. If Medicaid has paid for the employee s medical as it surrounds the injury that was sustained in workers compensation, then the employee must take from his benefits and pay back Medicaid those sums that they have expended for those medical services. However, Medicaid sometimes attempts to receive more than what they are entitled to and you must appeal their request for payment so that you only pay back Medicaid for those medical services which were rendered to your work-related accident. How would you like for us to respond to you (e.g., telephone, e mail, regular mail, doesn't matter)? FactsforWorkers.com A Legal Information Resource for Workers provided by Hedberg & Boulton, P.C. What do I do about time missed from work to attend appointments relating to my injury? 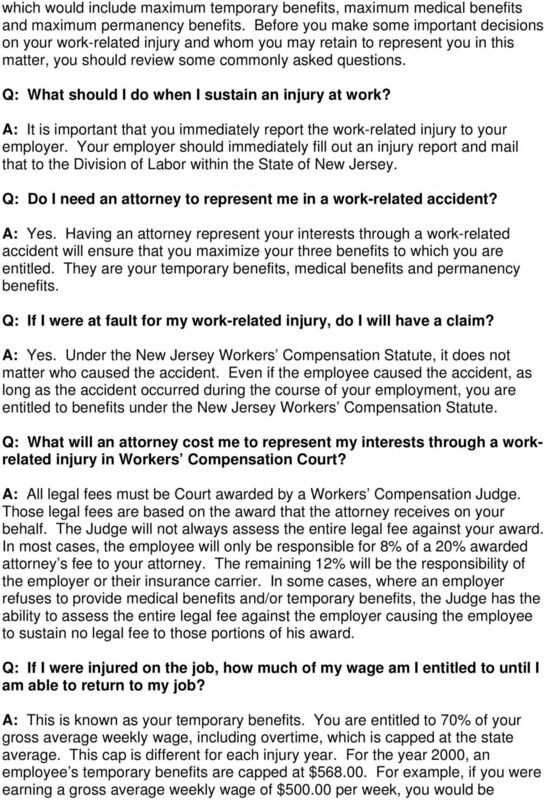 HOW TO DETERMINE THE VALUE OF A WORKERS COMPENSATION CASE What Is Your Work Accident Case Really Worth? TRIBAL COURT CODE CHAPTER 93 WORKERS COMPENSATION. 93.102 No Waiver of Sovereign Immunity or Application of State Law. TRIBAL COURT CODE CHAPTER 93 WORKERS COMPENSATION CONTENTS: 93.101 Citation and Purpose. 93.102 No Waiver of Sovereign Immunity or Application of State Law. 93.103 Definitions. 93.104 Reporting Obligations. 7 Things Every Family Lawyer Should Know About Social Security Disability Law. Is It SSI or SSDI?